Measurements: 3.75 x 7.5 inches, or 97 x 190 mm. Huge. Back of card: Solid ivory, completely unmarked. May be inverted. Booklet included: Yes, one of the best little books I've seen with a tarot deck. Measurements: 3.7 x 7 inches, or 94 x 178 mm, 38 pages, lavishly illustrated. Text by Stuart R. Kaplan. Publisher: US Games. Cards printed in Belgium, box printed in Switzerland, booklet printed in the US. Complete deck of 86 cards comprises 22 Major Arcana & 64 Minor Arcana, reproduced in magnificent color. 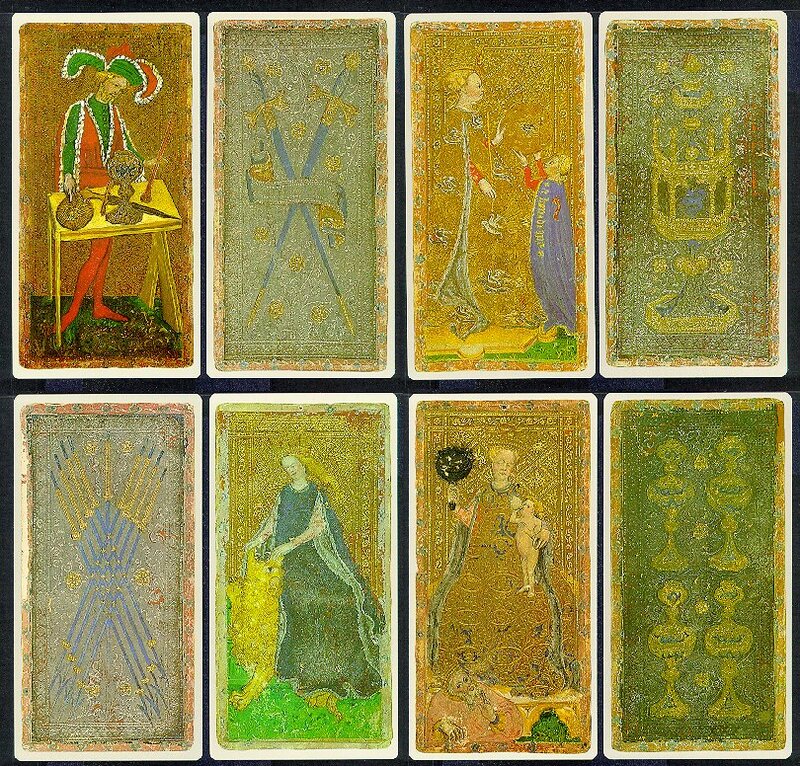 Facsimile reproduction of 67 tarocchi cards from the Cary Collection of Playing Cards at The Beinecke Rare Book and Manuscript Library, Yale University. Additional 19 cards recreated to replace cards presumed missing from the original deck. The deck is unique in that each suit contains both male and female knights and pages in addition to king and queen. Among the 19 recreated cards is the Magician, shown above. The original, surviving cards are in generally poor condition. Details on these cards are hard to see, even though the quality of reproduction is excellent. The recreated cards are generally much more colorful. These cards were created by Luigi Scapini in 1983. While the original artist may never be known for certain, it is suspected that one Bonifacio Bembo (b. c. 1420) created many of the surviving Visconti-Sforza decks. He was a Cremonese artist in the employ of the Sforza family. It is also suspected that several of the original decks were wedding presents, commissioned on the occasion of the union of two royal houses. Kaplan has other fascinating notes in the booklet with this deck. One packaging note: The deck we examined seemed wildly out of order.